Our range of products include balram 303 organic pesticide. Extract Tomato, Carrot, Grapes, etc. 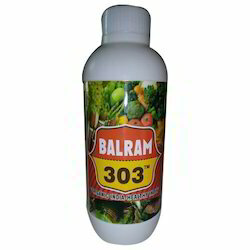 We are offering superior quality of Balram 303 Organic Pesticide. To be used only when insects, fungus & virus are out of control even after applying other pesticidesControls & Protects the plants from insects, fungus and viral attack: Enhances growth and immune power of the plantsHighly useful for all crops in any seasons.